Last year, the Georgia Retail Association Organized Retail Crime Alliance (GRAORCA) underwent a re-branding to the Georgia Retailers Organized Crime Alliance (GROC). It is our pleasure to share with you some of the great work this effective boots-on-the-ground part of our organization has recently accomplished. Last week GROC began a long-term and on-going partnership with the Dunwoody Police Department by holding its first ever ORC Blitz named 'Operation Spring Cleaning'. 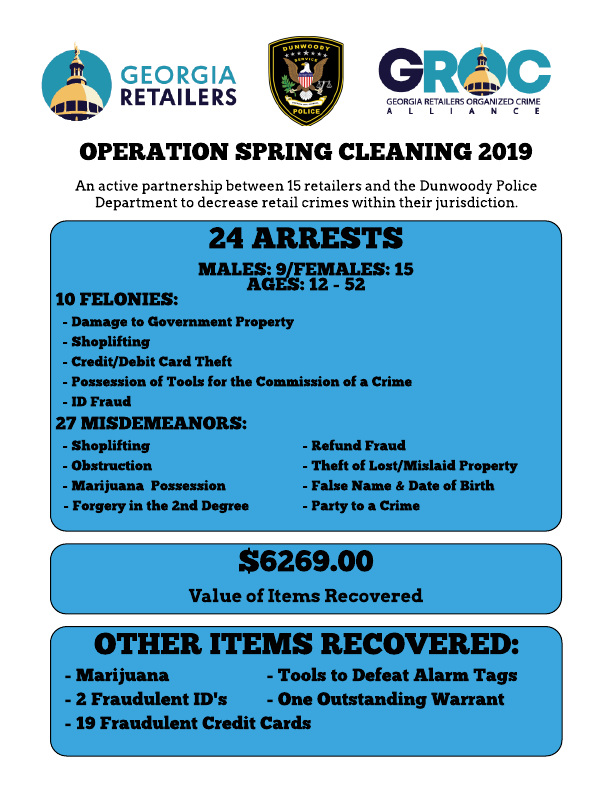 With 15 retailers participating the area around Perimeter Mall, the northern Atlanta suburb of Dunwoody was saturated with law enforcement, both in uniform and plain clothes, as well as plenty of our valuable loss prevention professionals. To find coverage on the event from the Atlanta Journal Constitution please click HERE. We believe the intended message was heard loud and clear: do not shoplift in Dunwoody! The Georgia Retailers & GROC look forward continuing this partnership with the Dunwoody Police Department, as well as partnering with other law enforcement entities throughout the state to stem the tide of retail crime in Georgia! We find ourselves at the conclusion of the 2019 Georgia legislative session. As has been mentioned previously this session was marked by multiple challenges. Amongst them a totally new administration in the Governors Mansion and in the Senate, a new leadership structure in the upper chamber, public challenges to the Speaker, and extremely controversial legislative measures. While no one got everything they wanted this session, and we were held hostage in last minute posturing between the House and Senate on “marketplace facilitator”, we consider this session a success for the Georgia Retailers. Not only did we ease the regulatory environment regarding vaccines, lower the sales tax collection threshold for out of state retailers, defend against multiple anti-retail measures, begin a discussion on comprehensive organized retail crime legislation, and assist in the push toward tort reform in Georgia, but we also raised the overall profile of the Georgia Retailers to a level not seen in many years. We would also like to thank our allies in “Team Retail” beneath the gold dome, Kathy Kuzava with the Georgia Food Industry Association and Angela Holland with the Georgia Association of Convenience Stores for their assistance and partnership. Below will find the summation of the measures in which we have been involved during this session, please bear in mind that any measure below which didn’t pass, and was not voted down, is still alive for the 2020 session as Georgia’s is a biennial legislative system. As we begin the interim please pay attention to our communications as we will continue to work on many of these issues as well as provide you with updates of concern to Georgia retail. Status: Bill has been filed and referred to the House Committee on Industry & Labor. The bill has been heard but not acted upon. Bill failed for the 2019 session and is alive for consideration in 2020. What This Bill Does: Prohibits an employer from using previous compensation, from another company, to set compensation or benefits for a prospective hire. Our Actions: The Georgia Retailers oppose this bill. Status: Bill has been filed and referred to the House Committee on Industry & Labor. Bill was heard but not acted upon. Bill failed for the 2019 session and is alive for consideration in 2020. What This Bill Does: Increases the minimum wage to $15.00 per hour, and provides for a credit toward the minimum wage for employers of tipped workers. Status: Bill has been filed and referred to the House Committee on Ways & Means. Bill has moved through subcommittee, the full Ways & Means Committee, and rests in the House Rules Committee. Bill passed the House and has been assigned to the Senate Finance Committee, where it was passed out. The bill has passed the Senate and heads to the Governor’s desk for his signature. What This Bill Does: Lowers the economic nexus threshold for online retailers doing business in Georgia to collect and remit sales tax from $250,000 to $100,000. Our Actions: The Georgia Retailers support this bill. The Georgia Retailers submitted testimony in support of this legislation, as well as submitted letters to each Representative in support prior to floor action. Status: Bill has been filed and referred to the House Committee on Health & Human Services. Language from HB214 was attached to SB115 as a House Rules Committee Substitute, which was carried by Chairwoman Sharon Cooper successfully through the House and the bill was subsequently agreed to by the Senate. The bill now heads to the Governor’s desk for his signature. What This Bill Does: Would allow all pharmacies under one company to utilize a single vaccine protocol agreement for the entire state. Bill failed to crossover. Our Actions: The Georgia Retailers support this bill. The Georgia Retailers have been working with stakeholders and will amend the bill to ensure the physician entering into such agreements are located within the State of Georgia. We were asked by leadership, on crossover when this was to be heard, to hold this bill so that HB483, the annual controlled substances update bill, could advance. We are grateful to our sister organization the Georgia Food Industry Association, Lieutenant Governor Duncan, House Majority Leader Jon Burns, Senate Majority Leader Mike Dugan, Chairwomen Cooper and Unterman, and Chairman Ron Stephens. Status: Bill has been filed and referred to the House Committee on Judiciary. Bill has been reported favorably from the Kelley Subcommittee and full committee by substitute. Bill has passed the House and been referred to the Senate Judiciary Committee. Bill was heard in the Senate Judiciary Committee where the language was stripped and replaced with language from the competing bill SB110. After the meeting of the conference committee the language of HB239 has been augmented to establish the new constitutionally mandated statewide business court. The bill now heads to the Governor’s desk for his signature. What This Bill Does: This bill would establish a statewide business court pursuant to the successful passage of the companion constitutional amendment in 2018. Our Actions: The Georgia Retailers support this bill, and at this time prefer it to the competing bill, SB110. Status: Bill has been filed and referred to the House Committee on Industry and Labor. Bill failed for the 2019 session and is alive for consideration in 2020. What This Bill Does: This bill would allow for any employee to be provided compensation information for any other employee by their employer. Our Actions: The Georgia Retailers are monitoring this bill. Status: Bill has been filed and referred to the Senate Committee on Insurance & Labor. Bill failed for the 2019 session and is alive for consideration in 2020. Status: Bill has been filed, passed the Senate and adopted. What This Bill Does: The bill would establish a study committee to review Georgia’s legal climate and its impact on business. Our Actions: The Georgia Retailers support this resolution. Status: Bill has been filed and referred to the House Committee on Ways & Means. A committee substitute with changes from the Department of Revenue was introduced and adopted. The bill was heard in the Ways & Means Public Finance & Policy Subcommittee and reported favorably by substitute to the full committee who also reported favorably. Bill has passed the House and been referred to the Senate Finance Committee. This bill was heard in the Senate Finance Public Policy Subcommittee, and full Senate Finance Committee where it was reported favorably with amendments. The bill was amended in the Senate Rules committee to include an exemption from sales and use tax for rideshare services, taxis, and limousines. The bill as amended passed the Senate and now rests in the House to await an agree/disagree motion. Bill failed for the 2019 session and is alive for consideration in 2020. 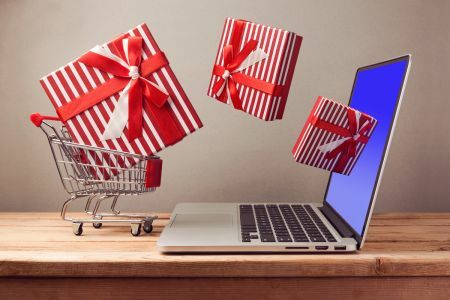 What This Bill Does: This bill places the burden of sales tax collection on sales made by third party vendors that meet a certain threshold to the internet marketplaces which host them. Special Summary: This issue became one of the premier “hot potato” issues on Day 40, and found itself lodged between the will of both House and Senate leadership. The inclusion and taxation of rideshare services, which heretofore have been untaxed in Georgia, became a sticking point. A path a was agreed to placing a .50 per trip fee on all such services on HB 365, which if agreed to by the House would allow SB128 to proceed to the Governor once agreed to by the Senate. Neither chamber was willing to move on either measure first despite every angle taken by us and others. We have the commitment of all stakeholders to accomplish this in 2020. Status: Bill has been filed and referred to the House Committee on Judiciary. Bill failed for the 2019 session and is alive for consideration in 2020. What This Bill Does: This bill would allow whether or not a plaintiff was using their seat belt at the time of an injury to be admitted as evidence in certain civil trials. Our Actions: The Georgia Retailers support this bill and have signed onto a coalition letter to express our support. Status: Bill has been filed and referred to the House Committee on Judiciary Non-Civil, the bill has been heard but not acted upon due to lack of quorum. Bill failed for the 2019 session and is alive for consideration in 2020. What This Bill Does: This bill creates record keeping and reporting requirements for purchasers of gift cards, as well as adds the element of conspiracy to shoplifting and creates the crime of retail merchandise fraud. Our Actions: The Georgia Retailers support this bill and have testified in support during the subcommittee hearing. We have submitted our bill to Governor Kemps office, as well as to Attorney General Carr asking for their support. We are working with multiple interests who had questions around the language of the bill, we are fixing those issues to have the bill prepared for further action. We have continued to work on this issue and have begun building a larger coalition for the 2020 legislative session. Status: Bill has been filed and referred to the House Committee on Regulated Industries. Bill failed for the 2019 session and is alive for consideration in 2020. What This Bill Does: This bill increases the number of liquor licenses a single entity is allowed to hold from two to eleven. Our Actions: The Georgia Retailers support this bill. What This Bill Does: This bill would allow for a ballot measure to amend the Georgia constitution that would give the General Assembly power to limit awards in certain civil cases. Status: Bill has been filed and referred to the Senate Committee on Judiciary where it was reported favorably by substitute. Bill passed the Senate by substitute and has been referred to the House Judiciary Committee. This bill has been referred to a conference committee. Bill failed for the 2019 session, some of its language was included in the conference committee bill, HB239 which passed and now heads to the Governor’s desk to await his signature. Our Actions: The Georgia Retailers support this bill, however at this time prefer the competing bill, HB239. Status: Bill has been filed and primarily referred to the Senate Committee on Economic Development & Tourism, then withdrawn and recommitted to the Senate Committee on Regulated Industries & Utilities. The bill was reported from the committee favorably by substitute. Bill passed the Senate by substitute and has been referred to the House Regulated Industries Committee where it was substantially amended and passed favorably and now rests in the House Rules Committee prior to any floor action. Bill failed for the 2019 session and is alive for consideration in 2020. What This Bill Does: Provides a framework under which retail liquor stores may allow in-store sampling of alcoholic beverages. Incorporates language from HB76, as well as allows for parity on Sunday retail sales for alcohol and removes the referendum requirement for the same. Our Actions: The Georgia Retailers support this bill as amended. Status: Bill has been filed and referred to the Senate Committee on Judiciary where it has been heard but no action was taken. Bill failed to crossover. Language was amended to HB171 while that bill was being heard in the Senate Public Safety Committee. The bill was heard on the Senate floor where it was amended to disable the bill, the bill subsequently failed. An attempt to reconsider the bill also fell short. Bill failed for the 2019 session. Status: Bill has been filed and referred to the Senate Committee on Judiciary where it has been heard but not acted upon. Bill failed for the 2019 session and is alive for consideration in 2020. What This Bill Does: The bill would establish that in an action to recover damages from death or injury only actual amounts paid for health care services or treatment shall be recoverable. Our Actions: The Georgia Retailers support this bill with a coalition of other interests and are working with the sponsor to include language that would also cover letters of protection. Status: Bill has been filed and referred to the House Committee on Ways & Means. This bill was heard this week but not acted upon. Bill failed for the 2019 session and is alive for consideration in 2020. What This Bill Does: Creates a sales tax exemption for certain feminine hygiene products. Status: Bill has been filed and referred to the House Judiciary Committee. Bill failed for the 2019 session and is alive for consideration in 2020. What This Bill Does: Comprehensive bill to protect the civil rights of any individual from discrimination in housing, hotels, restaurants, other places of business, and employment. Creates a civil action. Status: Bill has been filed and referred to the House Committee on Higher Education. The bill was reported favorably out of committee, however it was recommitted to committee. Bill failed for the 2019 session and is alive for consideration in 2020. What This Bill Does: Prohibits professional licensing boards from refusing to issue, suspend, or revoke the license of a person who is a borrower in default under an educational loan issued through the Georgia Higher Education Assistance Corporation or a federal agency. Status: Bill has been filed and referred to the House Committee on Regulated Industries. Bill received a hearing in the Regulated Industries Alcohol & Tobacco Subcommittee and was reported favorably by substitute in the full committee. Bill has passed the House and been referred to the Senate Committee on Regulated Industries & Utilities. The bill has been amended to include the original tastings language from SB146 as well as adding a referendum requirement. It rests in the Senate Rules Committee. Bill failed for the 2019 session and is alive for consideration in 2020. What This Bill Does: Allows cities and counties the ability to be less, but not more, restrictive regarding state mandated standoff distance requirements from certain places for an alcohol seller with an off-premise license. Status: Bill has been filed and referred to the House Committee on Industry and Labor. Bill was heard but not acted upon. Bill was heard again and reported favorably by the Committee. Bill failed for the 2019 session and is alive for consideration in 2020. What This Bill Does: Places at employer discretion whether or not pay an employee by check. Status: Bill has been filed and referred to the House Committee on Juvenile Justice. Bill failed for the 2019 session and is alive for consideration in 2020. What This Bill Does: Prohibits the sale of OTC drugs containing Dextromethorphan to minors. Status: Bill has been filed and referred to the House Judiciary Non-Civil Committee. The bill was heard in both the Reeves Subcommittee and full committee where it was again heard but no action was taken upon it. Bill failed for the 2019 session and is alive for consideration in 2020. What This Bill Does: Creates an exemption to the penalties for knowingly selling “brass knuckles”, which fit no more than two fingers and sold for the purpose of defense to a person under eighteen years old. Status: Bill has been filed and referred to the House Committee on Motor Vehicles. Bill passed committee favorably by substitute. Bill failed for the 2019 session and is alive for consideration in 2020. What This Bill Does: Requires sellers of license plate frames to provide notice to buyers, in writing, that use of such frames might violate state law. Status: Bill has been filed and referred to the House Committee on Health & Human Services. Bill has been reported favorably by the Committee. Bill has passed the House and referred to the Senate Committee on Health & Human Services. Bill has passed and awaits the Governors signature. What This Bill Does: This bill would restrict pharmacies that share ownership with PBM’s or insurers from receiving prohibited referrals via steering and/or data mining. It does not restrict PBM owned pharmacies from being in network, only from being treated preferably. Our Actions: The Georgia Retailers are monitoring this bill closely to ensure that no member is effected by this bill. Status: Bill has been filed and referred to the House Committee on Judiciary Non-Civil. Bill failed for the 2019 session and is alive for consideration in 2020. What This Bill Does: This bill would codify that certain persons are allowed to possess and handle controlled substances in the usual course of their business. Our Actions: The Georgia Retailers are monitoring this bill. The Georgia Retailers worked with the sponsor to remove the word “usual” from the bill to prevent unintended consequences to pharmacists. What This Bill Does: This bill would allow farm wineries to conduct wine tastings off-premises. Status: Bill has been filed and referred to the House Committee on Agriculture & Consumer Affairs. Bill failed for the 2019 session and is alive for consideration in 2020. What This Bill Does: This bill requires a manufacturer to provide certain items necessary for diagnostic, maintenance, or repair services on digital products within certain equipment. Status: Bill has been filed and referred to the House Committee on Insurance. The bill was favorably reported by the Committee. The bill passed the House and had been referred to the Senate Committee on Health & Human Services. Bill has passed and awaits the Governor’s signature. What This Bill Does: This bill, a companion in HB 323, makes changes to the Pharmacy Patient Protection Act by strengthening the anti-mandatory mail order provisions, extends protections to other dispensers, prevents PBM steering and delaying care for prior authorizations. Our Actions: The Georgia Retailers are monitoring this bill closely to ensure no member is effected by this bill. Status: Bill has been filed and referred to the House Committee on Health & Human Services. Bill failed for the 2019 session and is alive for consideration in 2020. What This Bill Does: This bill creates the State Vaccine Consumer Protection Office. What This Bill Does: This bill authorizes certain minors to receive vaccines without parental consent. What This Bill Does: This bill would allow for a central licensing procedure for retail alcohol licenses at the Georgia Department of Revenue. Status: Bill has been filed and referred to the Senate Committee on Health & Human Services where is was reported favorably by substitute. Bill has passed the Senate and the House and now awaits the Governor's signature. What This Bill Does: Brought by Attorney General Carr this bill increases the length of time information is held in the database from two to five years and allows the Attorney General’s Medicaid Fraud Control Unit access to the database. Status: Bill has been filed and referred to the Senate Committee on Health & Human Services. Bill failed to crossover. Bill failed for the 2019 session and is alive for consideration in 2020. What This Bill Does: This bill would require “adult changing stations” in public commercial facilities with an occupant load of over 1,000 persons. Status: Bill has been filed and primarily referred to the Senate Committee on Regulated Industries & Utilities. Bill failed for the 2019 session and is alive for consideration in 2020. What This Bill Does: This bill adjusts amounts of malt based beverages craft brewers are permitted to sale for off-premise consumption at their breweries. Status: Bill has been filed and referred to the Senate Committee on Health & Human Services. Bill was favorably reported by the Committee. Bill was amended to strip all the original language and now is a bill regulating travel insurance. The bill is heading to the Governor’s desk for his signature. What This Bill Does: This bill is relating to insurance, and provides for consumer protections and freedom of information regarding prescription drug benefits. Status: Bill has been filed and referred to the Senate Committee on Regulated Industries & Utilities. Bill failed for the 2019 session and is alive for consideration in 2020. What This Bill Does: This bill would authorize the manufacture, distribution, transportation, or sale of ice cream or frozen desserts made with alcoholic beverages without an alcoholic beverage license or permit. Status: Bill has been filed and referred to the Senate Committee on Agriculture & Consumer Affairs. Bill was reported favorably by the Committee and passed the Senate as amended. Bill failed for the 2019 session and is alive for consideration in 2020. What This Bill Does: This bill would ensure that any product labeled as “meat” unless it contains 90% meat or meat byproducts from the live carcass of a slaughtered animal. Status: Bill has been filed and referred to the Senate Public Safety Committee. Bill failed for the 2019 session and is alive for consideration in 2020. What This Bill Does: This bill would require specific secure storage requirements of firearms by a firearms dealer when they are not open for business. Status: Bill has been filed and referred to the Senate Committee on Health and Human Services. Bill failed for the 2019 session and is alive for consideration in 2020. Status: Bill has been filed and referred to the Senate Committee on Economic Development & Tourism. Bill received a primary public hearing, and a secondary hearing where it was reported favorably. What This Bill Does: Constitutional amendment which would allow pari-mutuel betting on horse racing as well as allow 24/7 alcohol sales at such an establishment. Bill was amended to disallow 24/7 alcohol sales, and such sales must match the local jurisdiction of the facility location. Status: Bill was referred to the Senate Committee on Finance where it was not heard. Bill failed for the 2019 session and is alive for consideration in 2020. What This Bill Does: This resolution would urge the State of Georgia to increase the cigarette excise tax to offset indigent health care costs. Amazon began collecting sales tax on items it sells in Georgia four years ago after a push from state lawmakers. Now, state leaders in Georgia and throughout the country are setting their sights on the mega-retailer again — this time, to collect taxes from the third-party merchants that sell through its site. The extra tax dollars would be a boon to state governments, but would end up costing online shoppers more. The third-party retailers, called marketplace sellers, use Amazon to sell, hold and ship their products. But Amazon doesn’t collect sales tax on behalf of those companies, and many of them don’t collect taxes themselves. Arguing they are losing millions of dollars in tax revenue, states are starting to take action — even as some of them are also trying to lure Amazon’s second headquarters, HQ2, with tax incentives and other inducements. Washington will start receiving more sales tax money in January after passing a law earlier this year requiring Amazon to collect those taxes itself on the sellers’ behalf. Massachusetts successfully sued for access to a list of sellers that have items warehoused in the state. And South Carolina sued Amazon this summer, saying the company was required to collect taxes for marketplace sellers and owed more than $12 million in taxes for just the first three months of 2016. James Thomson — the former business head of Amazon Services, which recruits marketplace sellers — said Georgia “almost certainly” already has the legal authority to demand sellers that have at any point had items warehoused in the state pay taxes here. “There’s this massive sales tax liability that most sellers are ignoring,” he said. Most sellers that aren’t charging sales tax rely on Georgia consumers to report their tax-free purchases, as the law has long required, and to pay the taxes they still owe by filling out state forms. It’s called a “use” tax, but shoppers rarely fill out the forms or pay. Online retailers push back against collecting sales tax themselves partly in an effort to keep their prices competitive. Legislation has already passed the Georgia House that would increase sales tax collections on online sales in the state if it becomes law, but it still must be passed by the Senate and approved by the governor. And Rep. Jay Powell, R-Camilla, said he is working on additional legislation that could force Amazon to collect taxes on behalf of its third-party sellers, instead of leaving it to those sellers to collect themselves. Who is required to charge sales tax for online sales comes down to one concept: physical presence. A 1992 Supreme Court ruling said if a company had a physical presence in a state, like a store or a warehouse, it had to charge consumers the sales taxes levied by that state. If not, there was no requirement. But for businesses that send their goods to Amazon to ship, having their inventory stored in a state — even for a day — could be enough to require them to collect and pay sales tax there. Powell’s proposed legislation, which passed the House this year, calls for a new taxing requirement. Instead of requiring a physical presence, he wants to create an economic presence. The bill would require tax collections for businesses that have more than 200 transactions in Georgia, or those that made more than $250,000 in sales in the state the previous year, regardless of where they are physically located. Sellers would be required to collect the tax, or to send Georgia buyers a notice saying that they owe it and must pay. In order to collect any back taxes that the state argues are owed under existing law, the Georgia Department of Revenue would have to track down Amazon’s marketplace sellers that have stored inventory in the state. Thomson warned it would have to happen quickly: Sellers that haven’t paid taxes in multiple states are likely to run out of money before they’re able to pay all that they owe, he said. That’s one reason, he said, Washington decided to forgo past sales tax collections in favor of simply requiring Amazon to collect in the future. But he said states that do go after back taxes have the opportunity to collect quite a bit. A Georgia State University report said the state had lost an estimated $204 million in tax revenue in 2016 from all out-of-state online sellers. That number was expected to grow by 8 percent a year until 2022. Jill Kerr, an Amazon spokeswoman, declined to comment on the issue of tax collection on the record. Georgia retailers are in favor of changes that require all online sales to be taxed, Powell said. James Miller, a spokesman for Georgia Retailers, said his organization just wants “equity” among all sellers. Two dozen states, in the hopes of getting sellers to voluntarily start paying sales tax, offered amnesty programs that would free them from having to pay some or all of the back taxes owed. Georgia wasn’t one of the participating states, but the number of sellers that signed up for the program, organized by the Multistate Tax Commission, was paltry — only 852 of more than 40,000 sellers that use Amazon for fulfillment of their orders. Richard Cram, the director of that program, said he suspects more legislation will be written nationwide to force the issue. He also said the company “probably wouldn’t be afraid” to use its headquarters search “as a way to discourage states from pressing them.” Thomson, though, doesn’t think the two are related. He said long-term growth and access to talent is more important to Amazon than the tax issue.